There are many brides who thrive on traditional weddings. This type of bride is all about formal invitations, stylish bridal portraits, and special first dance songs. She yearns to sachet down the church aisle to “Here Comes the Bride” while hundreds of her friends and family members gaze upon the beauty of her classic wedding dress. And then there is the other kind of bride. The free-thinking, non-conforming lady. The woman who doesn’t follow convention for convention’s sake. The one who has always marched to the beat of her own drum. It is this independently-minded lady who will likely opt to stroll down the aisle in a wedding dress that daringly departs from all convention. If your goal is to make all of your female wedding guests flush and your male guests gawk, just show off your legs with an above-the-knee skirt. For those of you who weren’t too sure about having sleeves on your wedding dresses. This is even more daring than a short hemline dress! While most dresses are basic silk, satin, or tulle, some are nestled underneath an overlay of cotton lace to create a more textured appearance. While this isn’t part of the wedding dress itself, a scarf accessory can have a substantial impact on the entire nuptial ensemble. For instance, a white silk scarf perfectly complements Platinum’s Silk Crepe Georgette Strapless Slim Gown and its scoop neckline. The scarf covers only the front of the neck and the top of one shoulder; it hangs down over the back of the dress and is tied in a bow at the center of the back. When you think of the bottom of a wedding dress, you envision long, clean lines of fabric. But a swirled skirt can break up the monotony of an ordinary fabric dress. 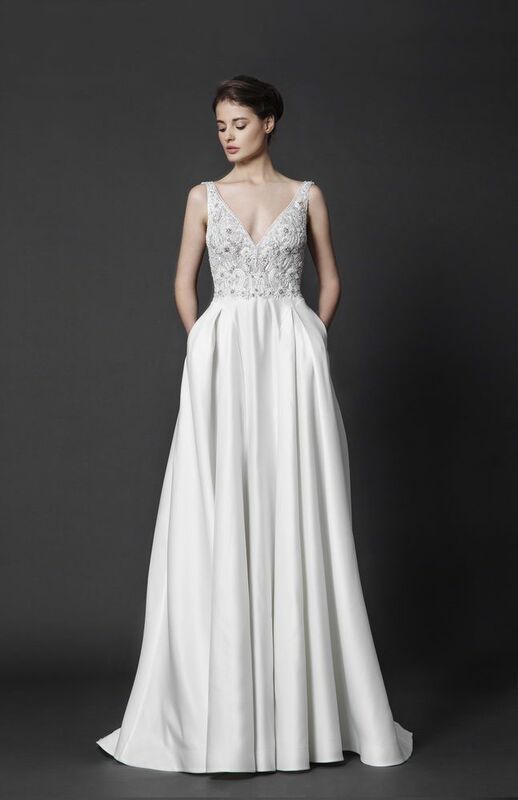 While slim wedding gowns do not flare outward around the legs, ultra-slim gowns practically cling to the legs. On a wedding dress? Really. They’re perfect for a bride who wants to carry something old, new, borrowed, and/or blue down the aisle with her; and also come in handy during the “dollar dance” at the wedding reception. The brides who think outside the box and coloured wedding gowns are the epitome of an adventurous stylish bride for us. We know that black might be the extreme end of the colour spectrum for most but trust me when we say that this Marchesa dress will make you think twice. So if you’re the type of woman who has flipped through hundreds of bridal magazine pages without finding the dress of your dreams, these ideas may be appealing to your unique tastes. After all – you were your own woman long before you met your mate. And even though you’re looking forward to having a partner for life, you still want to be identified by the traits and attributes which you worked long and hard to create and nourish – and not just as Mrs. So-and-So. An unconventional wedding dress is the first step toward reminding those in your life that you won’t remodel your personality and lifestyle just because you’re wearing a wedding ring. And when your guests see your extraordinary wedding dress, they’ll get the message loud and clear.